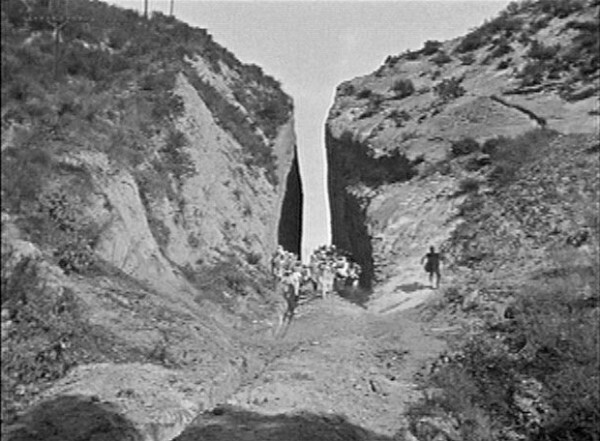 Comedian Buster Keaton (dark figure at right) is being chased through Beale's Cut by a group of women intent on marrying him in this screen shot from his 1925 six-reeler, "Seven Chances." According to the Internet Movie Database, Keaton, who often used the Santa Clarita Valley as a backdrop, stars as Jimmie Shannon, a financial broker who is on the verge of bankruptcy when an attorney presents grandfather's will, leaving him $7 million. In order to inherit the money Jimmie must marry before 7 p.m. on his 27th birthday  today. Directed by Keaton and written by David Belasco et al., this Kino Video/Metro Goldwyn Corp. release also features Ruth Dwyer as Mary Brown; T. Roy Barnes as Billy Meekin; Snitz Edwards as the attorney; Frances "Frankie" Raymond as Mrs. Brown; Jules Cowles as a hired hand; Erwin Connelly as the clergyman; Jean Arthur as the receptionist; and Loro Bara, Marion Harlan, Hazel Deane (as the refuser), Pauline Toler, Judy King, Eugenie Burkette, Edna Hammon, Barbara Pierce, Connie Evans and Rosalind Mooney. Photo from Paul R. Ayers, who writes: "I obtained (this photo) while working with John Bengston, author of 'Silent Echoes,' a book on Buster Keaton locations. ... In a later sequence (in 'Seven Chances'), he actually jumps over the Cut  quite spectacular."